i’ve had pac-man collection on the GBA for quite some time now, and it’s an enjoyable, albeit somewhat flawed, lot. i’ve been a fan of the ol’ yellow hockey puck ever since the chuck e. cheese ms. pac-man days, and i had the original NES version of pac-man as well (w/ patterns, it should be noted, that are quite diff. from the arcade version). anyway, you can read about the games included in craig harris’s good review at ign.com. after playing through all four for a while, i focused on the first, the 1996 re-make pac-man arrangement, featuring 22 different boards, plus a “boss” stage. the game itself is a great sequel, as it features power-up pills, jump (i.e. teleport) and dash abilities, and “super ghosts” w/ various powers to annoy you. all the additions work extremely well in expanding the gameplay w/out straying too far from the original experience. as w/ other games w/ unlimited continues it’s not too hard to beat the game, but it’s rather more challenging to get to the final stage on one continue. figuring out patterns will def. help, but your regular pac-man strategy is what you’ll find yourself relying on. the GBA version is limited by having to split the screen and scroll up and down to move from the top to the bottom, and no doubt the adjustment makes the game harder. but all in all it’s not too much of a problem to keep track of where the ghosts generally are at all times. i found it hard to play on the small GBA screen, and the DS directional pad was way too stiff for me, but using the gamecube game boy adapter and the d-pad on the gamecube controller proved to be the best combination for me. at some point i’ll pick up the namco collection that includes it, but w/ the exception of not having the split screen i doubt it’ll offer much of a new experience. i’m looking forward to delving into the other 3 games in this set to a greater depth, though. i found the split-screen version of the orig. pac-man included hard to play, and the full-screen version is impossible on the tiny GBA screen and awkward using the cube adapter. as you’d expect the full-screen mode is very strangely calibrated and doesn’t feel very natural to play, although i suppose you could get adjusted to it. 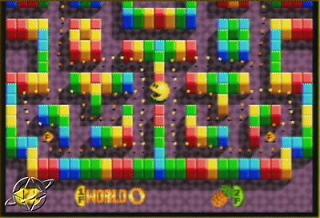 “pac-attack”, the tetris pac-man game, was quite fun, and i have def. plans to play through the puzzle mode (although you should note that in puzzle mode to make the order of the pieces the same for each board you have to manually change the setting. in the instructions it says to do this: “… highlight Puzzle, hold right on the Control Pad, and press the A Button”). still not sure how the 3-d “pac-mania” is going to fare, but i’ll try to keep an open mind.